Bulk SMS Software for Android Mobile Phone is designed to compose and send bulk text messages from your PC to group of mobile phone users using Android technology based mobile phones. Bulk SMS software easily sends multiple text SMS in English and Non-English characters without need of internet connection. User friendly SMS broadcasting utility easily works with Android technology based Smart phones including Samsung, Motorola, HTC, MicroMax, Sony Ericsson, LG etc. Group sms software is beneficial for broadcasting business marketing news, job alert, price alert, seasonal greetings and business campaigns etc. » Option to send message in both English and non-English (Unicode) characters. » Provides advance option to skip duplicate number entries. » Exclusion list Wizard option allows user to maintain the lists of contacts or Groups, which you may need to exclude time to time when sending messages. » Option to save sent message to templates. 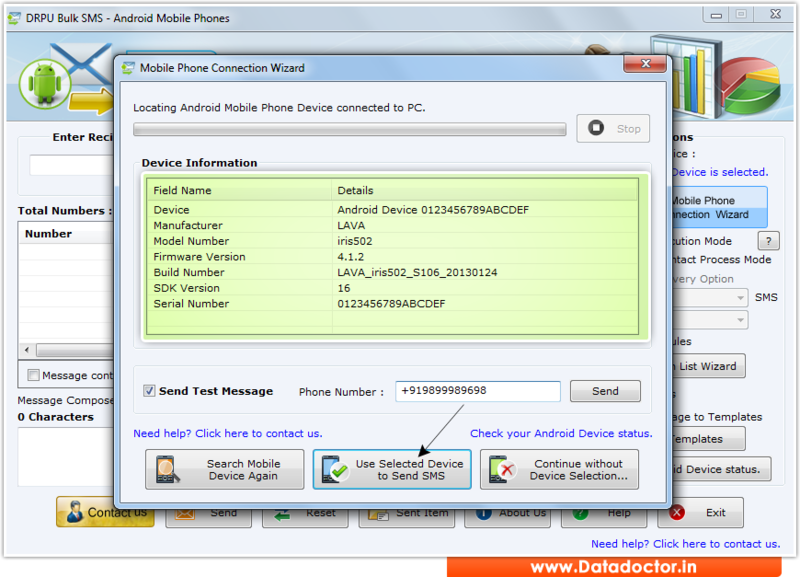 » Compatible with major Android technology based mobile phone devices.